Inspection and direct documentation of flue lines, ventilations and chimneys etc. 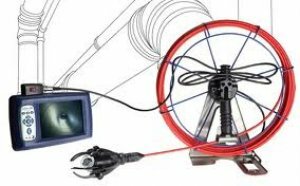 The VIS 2000-PRO Professional Video Inspection System is used for visual inspection of chimneys, ventilation lines, vents and pipes. Wohler VIS-2000-PRO Professional Video Inspection camera detects leakages and defects. Because of a pan and tiltable camera head, you can inspect every spot. The results of the inspection can be recorded to a CF- memory card in the Wohler VIS/2000PRO either as pictures or videos. Because of the modular design, you can later upgrade your Wohler VIS2000PRO, so it can also be used for other applications e.g. with a miniature camera head or a different camera rod. You can carry all components directly in front of your body, so you don´t need a place to set the Wohler VIS-2000 PRO onto.